I checked out Mathspace because of Dan Meyer’s post. I lasted all of 4 minutes. My answer in part b was no good. I tried again, but still I failed. But Dan’s post mainly reminds me that I want to share a little bit about EnCoMPASS. The EnCoMPASS Project is developing an online professional teaching community of mathematics educators focused on understanding and improving mathematical thinking through work with formative assessment rubrics and feedback to student problem solving. In this community, members extend their content knowledge for teaching and seek to become more effective at supporting the mathematical development of each student. I spent a week in Philadelphia working with a lot of caring teachers and the dearest Math Forum folks. For some years now, teachers can give feedback to students on their PoW write-ups at the Math Forum. A student submits her solution online, then the teacher can give feedback, and the student-teacher exchange may continue from there. On the second day of school (8/26) I assigned the PoW to my 8th graders. They have one week — until 9/02 — to submit their solution. I’m reserving next week as our reflection week, meaning I’ll log in and give them feedback and let them know when I’m done so they can respond to my feedback. My plan is one PoW every two weeks: 1 week for them to work on it, and 1 week of us to go back-and-forth. We’ll see. If that’s not enough time, then I’ll change it to one every 3 weeks, or one every 4 weeks. The point is: we are doing this. Extra: Suppose my neighbor had four dogs instead of three, and that when he told me about their weights each statement he made included the total weight of three of his dogs. What’s the smallest number of statements he could make that would let me figure out the weight of each dog? Why do you think so? And I’m looking forward to giving my students feedback in the form of I Notice I Wonder. I must be specific in my feedback. I must be constructive. I must be appreciative. I must be helpful and kind. If I do this correctly, then hopefully it means that the student will want to respond, want to revise, want to learn from this exchange. I must not screw up!! Well, EnCoMPASS is working on making this student-teacher exchange all of the above and more. Teachers can highlight any part of a student’s work and thus respond to it specifically. We may ask permission to see work from other teachers’ students. We can categorize our highlighted passages and put them into folders, perhaps of the strategies used. EnCoMPASS is also working on allowing students access to see other students’ submissions and respond to them. In a nutshell, EnCoMPASS is the fancier version of what they have now. I started subscribing to the Math Forum’s PoW since 2007 — Suzanne confirmed this for me. Yet I still have a lot to learn about giving kids the best kind of feedback. It’s a teaching endeavor. A human one at that. Something a well-intentioned software can never achieve. This entry was posted in Teaching and tagged EnCoMPASS, feedback, giving feedback, I Notice I Wonder, Math Forum, meaningful feedback, PoW. Bookmark the permalink. Post a comment or leave a trackback: Trackback URL. Fawn, I have to object to one detail in this wonderful post and that is your comment, “I must not screw up!” — teachers, just like students, are going to screw up and it’s OKAY. Giving good feedback is a process just like problem solving and communication is a process. I actually think that you already know this! … but … just in case I’ll emphasize it. Annie responded to a tweet the other day about how some of the “old feedback” she wrote will be personally embarrassing for others to see … but … it will be good blog fodder … or, in other words, folks will be able to reflect on it and think of ways to improve it. And, knowing Annie she will be the first to chime in on what she notices and wonders about her own “old feedback”! For me, giving “good” feedback shows when students continue thinking that the solution is “their math work” and you can tell that they’ve not ceded ownership to the mentor/teacher. Or, in other words, when they feel positive about continuing to work on their solution — reflecting, discussing, revising. I’m looking forward to reading more stories about EnCoMPASS and, in particular, as you use the software with your students — possibly starting in a week or two or three. Exciting! I’m from Mathspace and came across your post. You’re right. Mathspace was expecting an equation (so n=3) for an answer there. 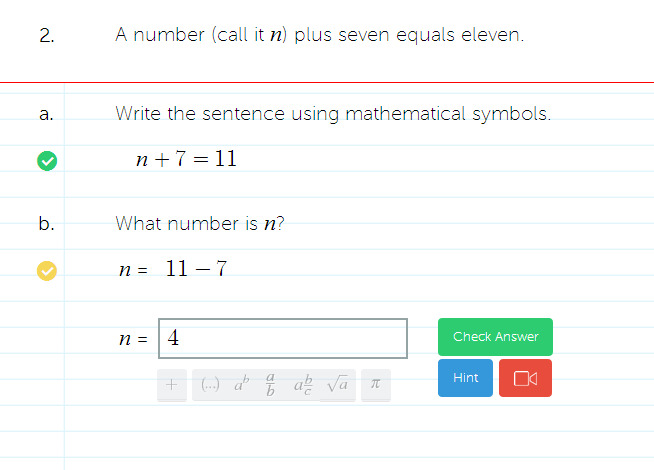 One of the things we’re trying to do at Mathspace is teach students to write Maths correctly and not just choose from multiple choice options. So in solving equations we ask they write an equation rather than just a number. Having said that I agree with you that this being an introduction to Equations topic that we should make it clearer what we’re looking for. So we’ve adjusted the question to include an n= [ ] at the front. That way we still maintain the mathematical correctness of an equation but aren’t frustrating students as they are still coming to grips with Equations. Oh for some precision in this computerized age. Well, I have an answer for that, and it is not 3 or n=3. What ever happened to “What is the value of n?” ? If we don’t start off properly, avoiding sloppiness, then we do a lot of damage to the understanding of math and its language. Thank you, Howard. I completely agree. Making it clear from the start that they are expecting an equation would be nice. However, after the first “uht-oh,” there is a link to a short video that clears it up pretty quick. Possibly slightly inconvenient. However, I don’t think we should be comparing Mathspace feedback to real teacher feedback. I can only assume Mathspace is on a mission to ditch the textbook, rather than ditch the teacher giving feedback. Most people reading your blog or Dan’s are probably rocking the descriptive feedback both verbally and written. Step into some other classrooms and students are getting a bunch of examples, set of practice questions from the textbook, and an answer key at the back of the book. Oh, and don’t forget the test on Friday – they get that, too. As long as people don’t take these tools and expect them to replace things such as real descriptive feedback from the teacher, they can definitely help improve learning IMO. I don’t think we should be comparing Mathspace feedback to real teacher feedback. You’re right, we should never do so, and I didn’t mean to as I know that’s not Mathspace’s intention whatsoever. Dan Meyer’s post about “feedback” just reminded me to share about the actual teacher feedback that the EnCoMPASS folks is working on. I’ve followed Dan’s post and the ensuing feedback from it from afar and am having a hard time wrapping my head around this software. While in theory it sounds great, I do worry about the same sort of problems you ran into on part b when it comes to the Smarter Balanced test taken by computer. While I obviously believe that integrating technology is a big part of what we should be as math teachers, I wouldn’t want a student getting penalized on the “high-stakes” test for formatting their answer in a way that is not desired by a computer grading the test. If we’re tying anything together with this test, I hope that their software at Smarter Balanced would be vetted better than Mathspace’s software but I guess that still remains to be seen. As for the Math Forum’s PoW and the feedback portion, I was wondering how that was going for you and how timely you were able to get the feedback out. I share the same concern as you as I have 120 students and would love to incorporate this tool into my classroom and agree personalized, quality feedback is more meaningful than any letter grade I slap at the top of a test. I’m just wondering how big of an undertaking this feedback is for you. Thanks! You’re right that we can’t allow software to penalize students because of formatting, wording of a question, or any other reason. However, when you mention “high-stakes” (i.e. : standardized) testing, often times multiple choice is used. Which is more likely to penalize a student? Software with some formatting glitches that can likely and should be fixed or a standardized test that says a student is wrong because they made a sign error, rounding error, operation error, or some other very small calculation error? While I think we are a far way from “high stakes” testing using software, let alone software that can recognize text and attempts to provide feedback, standardized testing is CURRENTLY penalizing students because they didn’t come to the correct number at the end. I believe Mathspace was created as a tool to help students learn and practice with some opportunity for feedback over a traditional textbook. High stakes tests are in a completely different category that don’t come close to offering students who struggle in math a fair chance at improving. I’m assigning one PoW every two weeks and it’s staggered. For example, my 8th graders were assigned a PoW during week 1, they had Monday to Monday to submit solution online. Then during week 2, my 6th graders were assigned theirs to work on, Monday to Monday. So, I used week 2 to go over my 8th graders’ write-ups. It takes a full evening (2+ hours) to do 1 class, Jeff, so I need two full evenings for each grade level. I’m hoping to get better at this, just more efficient. I’m currently giving feedback to the Math Forum regarding ways to streamline this process. I’d suggest one PoW every month then if you’re just starting out and having that many kids. We want to be realistic so that it doesn’t overwhelm us. I don’t want teachers to try to do too much and then have to give up the entirely. I would really like to use peer editing in my classes this year and I would love for students to use a Notice/Wonder framework when they peer edit. Do you have any suggestions or examples of student work that uses this framework for peer editing? Or examples of your Notice/Wonder feedback on their work?